Although a step-up of HTC's Desire 12, the Desire 12+ is still pinned to the middle-class smartphone market, having its cons led by the low-caliber 1440 x 720 HD+ resolution of its large 6-inch display, which would have otherwise been a pro, knowing that it resembles many popular flagship phablets with its wide 18:9 aspect ratio . It also sticks to a 2965mAh battery capacity despite a good number of similarly-sized smartphones reaching up to 4000mAh of power. Among its most desirable features are the 2TB microSD card slot accompanying its decent 32GB internal memory -- as of this technical pros and cons review, only a handful of other smartphones support 2TB top-up storage allowances, most of them being of a higher caliber than the Desire 12+. Additionally, this Plus edition upgrades the plain Desire 12's 13-megapixel rear camera to a dual-lens system consisting of a 13-megapixel main lens and a 2-megapixel depth-sensing deputy lens. Note, though, that the dual cameras of many high-caliber imaging smartphones have much-higher resolutions, so the Desire Plus's dual cam will not likely to come out on top versus those kind of setups. Nevertheless, rocking two cameras side by side enables things like Bokeh Mode , for natural background blurring. Up front, it sports an 8-megapixel fixed-focus selfie cam that may not sound promising resolution-wise , but is bedecked with its own frontal LED light and a soft-tone selfie light (aka screen flash) . For a phone of its size, the HTC Desire 12 Plus is rather lightweight, weighing in at only 157.5 grams , whereas a lot of its 6-inch rivals have bodies that weigh roughly 180 grams. 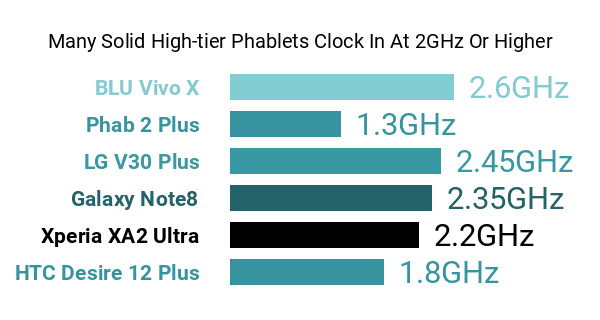 Regrettably, its processing components, which include a 1.8GHz eight-core Snapdragon 450 processor and a tolerable 3GB RAM, are far from heavyweights in this category as well, especially when pitted against the hardware setups of some of the best octa-core smartphones to date. Its pros and cons also include a rear-mounted fingerprint scanner, which the plain Desire 12 awkwardly lacks, and the Android 8.0 Oreo operating system infused with the brand's signature HTC Sense mobile companion that's dedicated to things like power management and performance monitoring. With a liquid surface finish wrapping its aforementioned specs, the Desire 12+ caters to middle-class smartphone shoppers looking for a not-too-ambitious wide-screen smartphone that's generous when it comes to multimedia storage.